One of my new year's resolutions was to start a blog, so I'm going to check this one off early. I look at thousands of postcards each month, and often find ones that are worth commenting on, so I hope to use this as a forum to mention notable finds and other random Postcard thoughts. 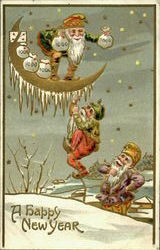 Since New Year's Eve 2008 is next week I thought it would interesting to look at a few postcards from 1908. I thought this one was interesting, even though technically it's for New Years 1909. I couldn't find much info on the history of New Years Elves. Are these Santa's elves? Where are they going with all the cash? You might think they're handing out money as New Years gifts, but these elves don't look all that charitable. I'm thinking Santa might have taken a bit more than cookies and milk on Christmas eve and now his elves are helping him launder the cash in a Ponzi scheme in Greenland. Here's another one from the same series. 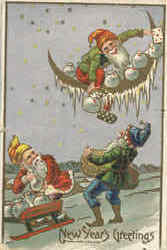 You can see there's also a what looks like a playing card in the elf's hand. Maybe the elves took hustled Santa in a no-limit game of Texas Hold-em. Anyway, I'd be curious to hear more about the history of the symbolism here with the elves, money, moon, and playing cards.